Quality Remanufactured 40 S&W ready to shoot. Each round goes through a rigorous process in order to ensure both quality and accuracy. We know the difference between commercially remanufactured and reloaded ammunition. Each round is inspected before shipment to ensure that no crack or debris ends up in your round. We take pride in our extensive knowledge of each caliber we produce. The .40 S&W got it’s start when it was developed in 1990 to give the FBI a round that would out perform their 10mm round and operate in a semi-auto pistol. Smith & Wesson joined forces with Winchester to create this powerful, yet inexpensive, round. However, Smith & Wesson was beat to the punch of offering a gun in the new round by their Austrian competitor Glock, when they introduced their Glock 22 and 23 models just a week before Smith & Wesson announced their model 4006 pistol. With regards to competitive shooting, the .40 S&W is one of those rounds that you either love or hate; there’s no in between. Those against the .40 dislike the amount of recoil, suggesting a 9mm allows them to get back on target faster. 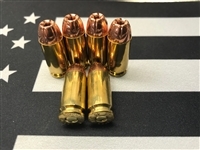 Those on the other side, who shoot nothing but the .40, often do so with custom tailored rounds that they have spent countless hours on fine tuning to resemble the recoil of the 9mm while having the same power and hole size of the .40. Magazines often hold the same amount between the 9mm and .40, seeing as they are similar in size. In fact, a gun can be retrofitted with a simple barrel change from on to the other. Be mindful, however, of the power factor involved with shooting a .40. You will often have to find a compromise between a lighter bullet of a low powder charge to qualify for most matches.